This authoritative, new edition of the world’s most loved songs and arias draws on original manuscripts, historical first editions and recent research by prominent musicologists to meet a high standard of accuracy and authenticity. Includes fascinating background information about the arias and their composers as well as a singable rhymed translation, a readable prose translation and a literal translation of each single Italian word. 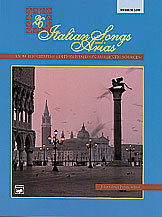 26 Italian Songs and Arias For Medium Low Voice – This authoritative, new edition of the world’s most loved songs and arias draws on original manuscripts, historical first editions and recent research by prominent musicologists to meet a high standard of accuracy and authenticity. Includes fascinating background information about the arias and their composers as well as a singable rhymed translation, a readable prose translation and a literal translation of each single Italian word.